Via Rail is Canada’s National train network and it operates 19 routes across the whole country of Canada. From city routes to cross country journeys, Via Rail has many exciting trips for you to enjoy. City hop from Toronto to Montreal or why not discover the stunning Rocky Mountains; the great thing with Via Rail train journeys is that we can build them into the perfect Canadian tailor-made holiday for you. Via Rail train journeys are perfect for those who want to see the sights and cities of Canada on a comfortable adventure. 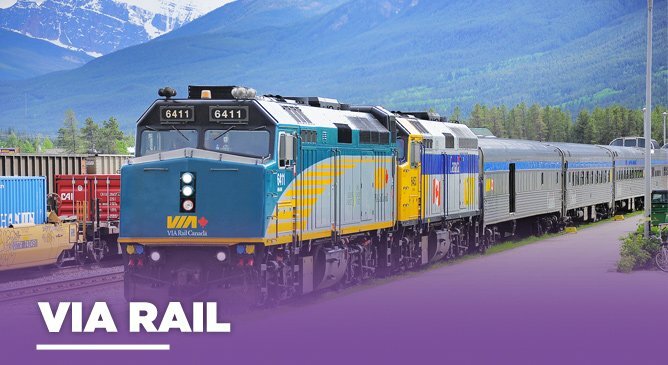 For help and advice with booking a Canadian rail holiday with Via Rail, contact Tour America’s Canadian travel experts today on 01-8173535 for more information.